I was born in 1992 in Wiener Neustadt, Austria. My family already took me out into nature for hiking in my early childhood and thus, the approach to nature was set. I remember my greatest delight was being outside and observing crawling animals, such as spiders and beetles. After visiting the palm house in Vienna a couple of times, it was clear to me that one day I simply had to visit the tropics myself. The high humidity, the beautiful colours and the smell of decomposing plants captured my imagination and has stuck in my mind ever since. As a consequence I enrolled biology at the University of Vienna and shortly after, I was on my first trip to the tropics. Due to the exciting scenery and the fascinating wildlife, the quality of my photographs has become of increasing importance to me. Capturing fascinating nature and the atmosphere of the wilderness helps me sharing my experiences and showing people the beauty of nature. In the beginning I focused primarily on reptiles and amphibians, but for about three years, I have broadened my scope to wildlife in general and landscapes. By belonging to the early bloomers, the pasqueflower runs into danger, being covered by snow again in early spring. But its fine hair and colouration makes it perfectly adapted to this unpredictable conditions. Whilst almost all white-storks migrate into the South during winter, some individuals stay here at Lake Neusiedl. Those storks risk their lives by not finding enough food and freezing due to cold temperatures. As a trade off they will most likely be able to occupy the best nests and have a better breeding success. I've been waiting for hard snowy conditions like in this picture for longer now, but never had the chance to take a picture, as the snow disappears fast again in this area. This year I managed to capture photos of white storks wading through a field of snow. Ice structures from collapsing ice floes of a groundwater fed river in Austria. By using my tripod as an “arm-extension”, I managed to capture this scene perfectly centered from above. I photographed this tawny owl (Strix aluco) in autumn, at a time when the leaves of most trees had already changed colour. By moving a little bit back from the subject and including the beautifully coloured leaves in the foreground, I tried to capture the scene just as I experienced it with my own eyes. Hidden during day, scorpions can easily be spotted during night with the use of an UV-light source. This order belonging to the arachnids possesses a cuticle which fluoresce cyan-greenish, when exposed to ultraviolet light. I found those four scorpions of the genus Euscorpius on the inner side of an arch of an old ruin in Croatia. Montpellier snake (Malpolon insignitus) from the Croatian Mediterranean steppe on Cres Island. An owlfly (Libelloides) from the Croatian Mediterranean steppe is just about to take off. Two American crocodiles (Crocodylus acutus) slowly swim against the current up Rio Tarcoles in Costa Rica. Visitors can safely watch this endangered crocodile species from a bridge across the river. Most animals rest in the sun along the river banks. But occasionally some of them emerge in the middle of the river to drift in the current. Finding those well camouflaged and cryptic living animals in wild nature is very tricky. Especially in Europe, in this case Croatia, I only rarely hear from encounters with this kind of insects. A special modified lens was used to get such an extreme wideangle macro photo where the magnification is still big enough. 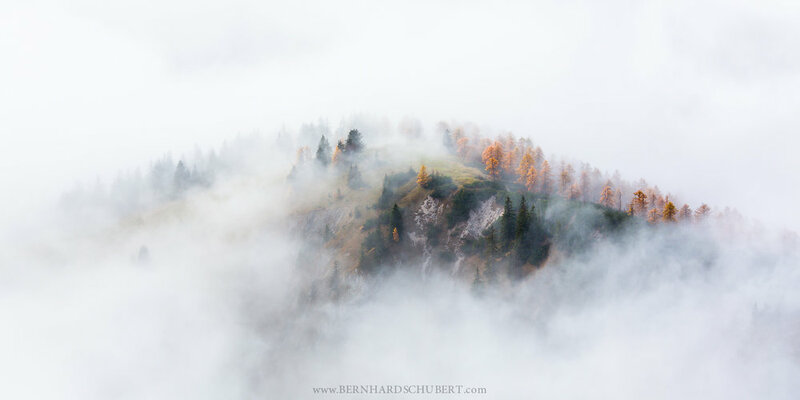 During autumn as most kinds of trees drop their leaves, I visited the Alps of Berchtesgaden. Leaving the hard and pretty unimpressive ascent behind, the fog slowly cleared up and set some of the neighboring hilltops free. Between other evergreen conifers, the larch trees were already in the full process of changing colour and stick out of the landscape. Lycosa singoriensis is the biggest tarantula (wolfspider) one can find in Europe and even is one of the rarest spiders of Austria. The animals are nocturnal and live on large sandy spaces. Whilst females build a tube up to 50cm deep in the ground, the males prowl around in search of females. Fire-salamanders can actually be found quite easily near my home. Basic prerequisite is a rainy weather which drives the amphibians leaving their holes and go in search for food or mating partners. Similar like the photo of the stick insect, I used a modified lens. During autumn as most kinds of trees drop their leaves, I visited the Alps of Berchtesgaden. Leaving the hard and pretty unimpressive ascent behind, the fog slowly cleared up and set some of the neighboring hilltops free. Between other evergreen conifers, the larch trees were already in the full processing of changing colour and stick out of the landscape. The reticulated python belongs due to the incredible lengths and the beautiful pattern to one of the most impressive snakes of whole South East Asia. This individual was just about to cross a frequently driven road. At one part of its body, the snake was very thick because of a larger meal which still needed to be digested. Though the animal could only move slowly and would have never made it on the other side of the road. As I stopped, the snake turned around and rested next to the street. I encouraged the snake to move its head on top of the big part of its body by moving my head closer and closer to the snakes head while staring at it. As it was in position, I lightened the animal with two torches from different angles. After this photo, the animal was carefully moved to the other side of the road where it obviously wanted to go. I managed to get this photo of a fire salamander larva, by using a waterproof torch which I put beneath the leaves underwater. As I wrote my bachelor thesis about fire salamanders, I was in the field quite frequently. At my study site, the salamanders are very common and there are lots of larvae in the small pools, so it did not take long until a larva passed by. The blue ground beetle is definitely one of the most eye-catching carabids of Austria. By using a longer exposure I tried separating the beetle from the busy mossy underground on which it was running on. 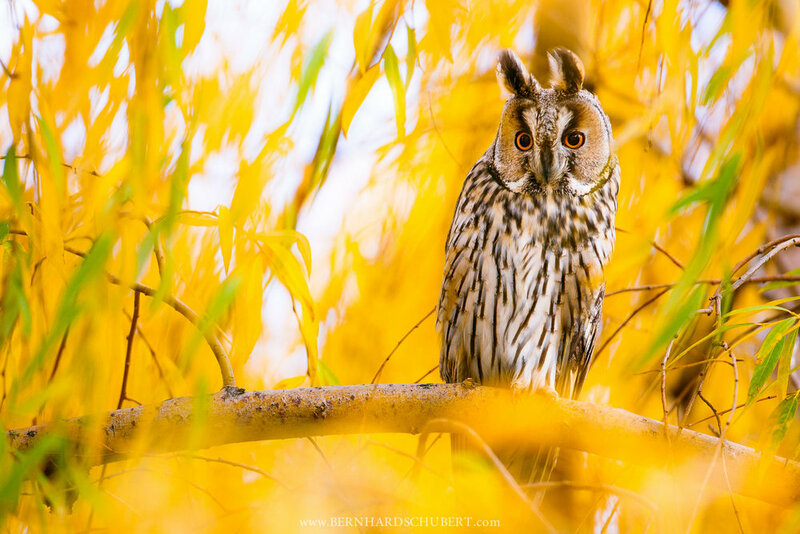 It simply was the perfect time at the right location allowing me to capture this photo of a curiously looking long-eared owl. Nearly all leaves of this willow turned already yellow serving well for a colourful picture. Also there was not only this one individual sitting in the tree but even more than 15! This so called communal roosting behaviour during winter is well known for this owl species and can be observed annually at the same trees. Unfortunately this beautiful willow was destroyed by a thunderstorm only one and a half year after I took this photo.